What a treat! Just as the rest of Greece, Salamina has such an amazing history, which renders it so famous, although it has never been promoted as a commercially tourist destination. Modern Salamina looks and feels more like an extended Athenian suburb, but still, it hides some gems in its grounds. The island's name derives from the mythological nymph Salamis, the mother of the first King of the island. The island is the birthplace of AJAX, the grandson of Jeus and legendary warrior, who led 12 Athenian ships into the Trojan War. The ancient Greek playwright Euripides was also born there and was inspired by the surroundings to write his work Hippolytus. 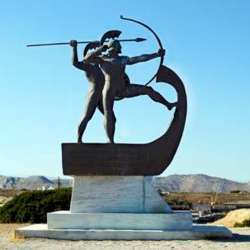 Salamina is mostly famous for the Naval Battle of Salamis > the decisive naval victory of the allied Greek fleet, led by Themistocles, over the Persian Empire and King Xerxes in Protected content . Although Greeks were outnumbered, they won the battle; if it was not for their courage, our Western Civilisation would not be what it is today. The island played an important role in the Resistance war against the German army in both World Wars. Today, many ship companies send their ships for maintenance at the island's famous shipyards. We will have coffee and light lunch in Salamina. We will take the late evening ferry to return to Pirreas. Please bring with you comfortable clothes and walking shoes, a bottle of water, packed breakfast/lunch and an umbrella. Please also note that nearer at the time I will post details and exact timings on opening times, ferry timetables and ticket prices. Join us alone or with friends on this beautiful day out in Salamina.